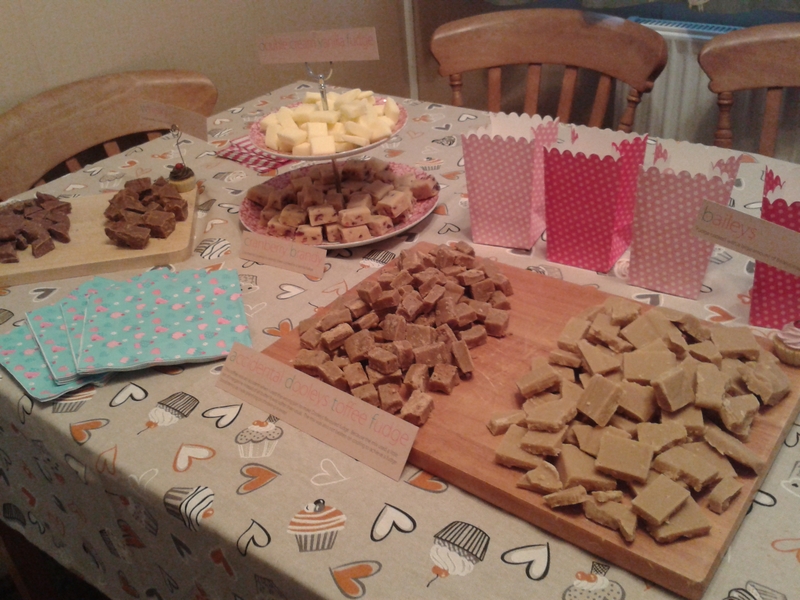 Since I am still at home waiting for HR to sort out everything for my new job I have been spending my time with my family and my stove, specifically I have been making fudge – a lot of it! I have been really thinking about making it into a little business that I can do part time running the occasional stall here and there. Its really exciting and I’ve always fancied the idea of being my own little boss so now I am really looking it. I have contacted our local environmental health about my kitchen and whilst waiting for them I have been practicing. I have encountered a lot of issues and was kinda lulled into a false sense of security because my first few batches of fudge came out so well that I thought, “hey, this is easy!”. How wrong I have been. I am currently writing this as a failed batch of simple vanilla fudge has split and is cooling in the kitchen ready to make its way swiftly to the bin. For some reason this time it has split and I have no idea why! Still, I will get back on my fudge horse and try again. I have learnt a lot though and every mistake tells me what I did wrong so that next time I can fix it. I’ve learnt you can re-cook over heated fudge, not to stir too early to stop crystal formation, the right pan to use, altering the temperature to suit your thermometer. It’s no wonder there is no one recipe that is fool proof. I will get this and some of the fudge that has worked has been fantastic, my dad even said it was the best he’d ever tasted (my dad will eat anything though!) 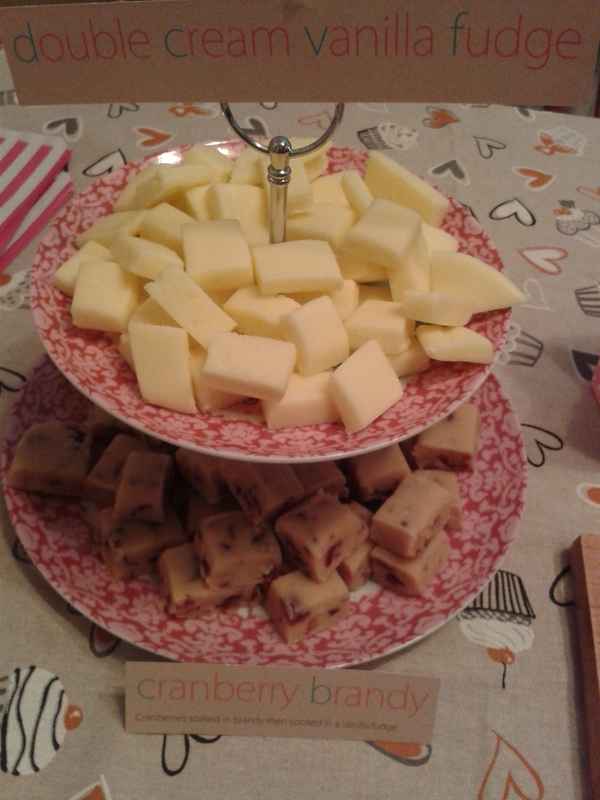 and my fudge party that I held so friends and family could help me eat some of the mountain was very well received. Now I just need to keep at it… practice, practice, practice and then one day I might be at a stall near you. I created two first birthday cakes for my daughter, the first was a small zebra cake to take with us to the Safari Park (as seen in my last post) then the second one I made was a lot larger for her birthday party. Alice isn’t really into much at the moment, being only 12 months old so far, but she will stop everything she is doing to sit down and watch an episode of In the Night Garden. 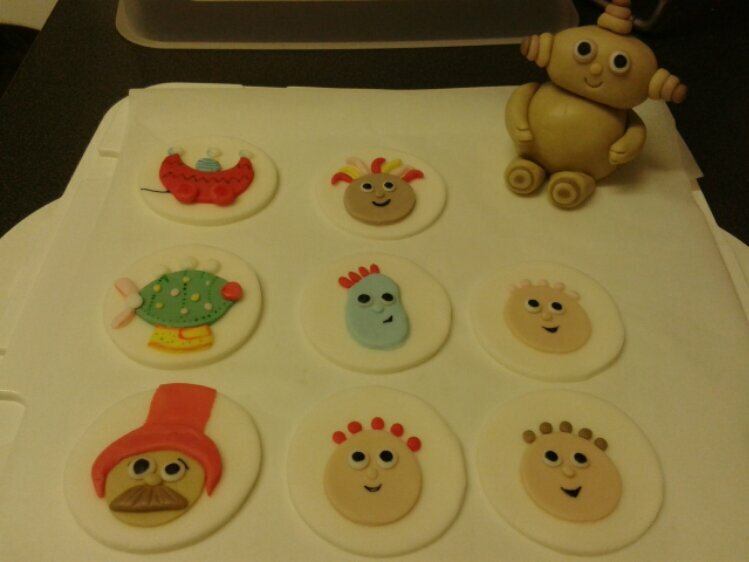 It is also a great theme for a cake as there are loads of colours and simple characters to make. 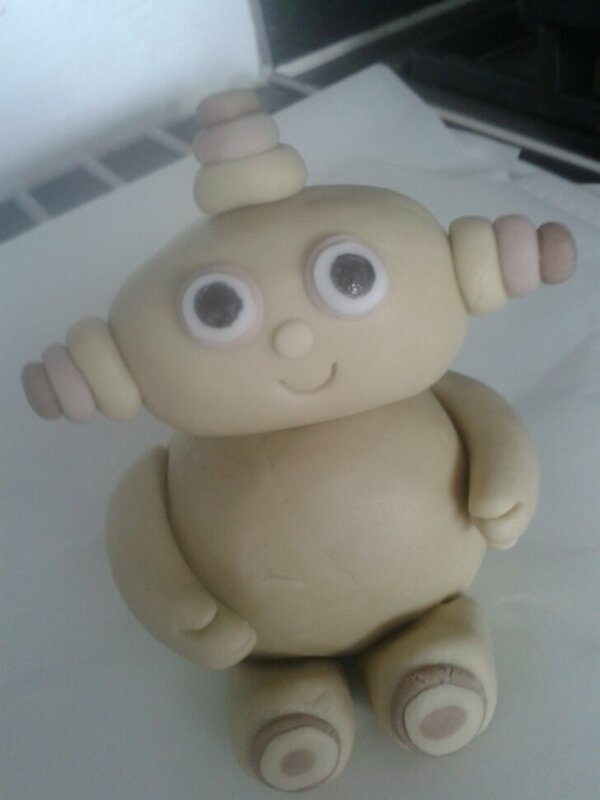 I decided to be brave and have a go at making a figure for on the cake – Maka Paka! I have only ever made one figure before and that was a rather sad looking teddy bear which was far too fat and sunk down after a few weeks. It wasn’t my finest cake decorating moment so I don’t know what possessed me to try again but I did. I think he actually came out ok, not perfect by a long way but he had the general appearance, though his eyes were quite big giving him a ‘chibi’* look. He managed to make it to the party without his head or any other limb falling off so I think that was a bonus! Sorry for the poor photo, it was late at night when I finished. I also made circles of icing of the other characters and places them around. Unfortunately I didn’t have a clear image in my head of what the final piece would look like but I hoped that when I started to put it together I would get an idea. The cake board I bought was too large, the cake didn’t seem high enough and the green colour icing I made was a little too bright but I thought that I had come this far… I was going to finish the cake! 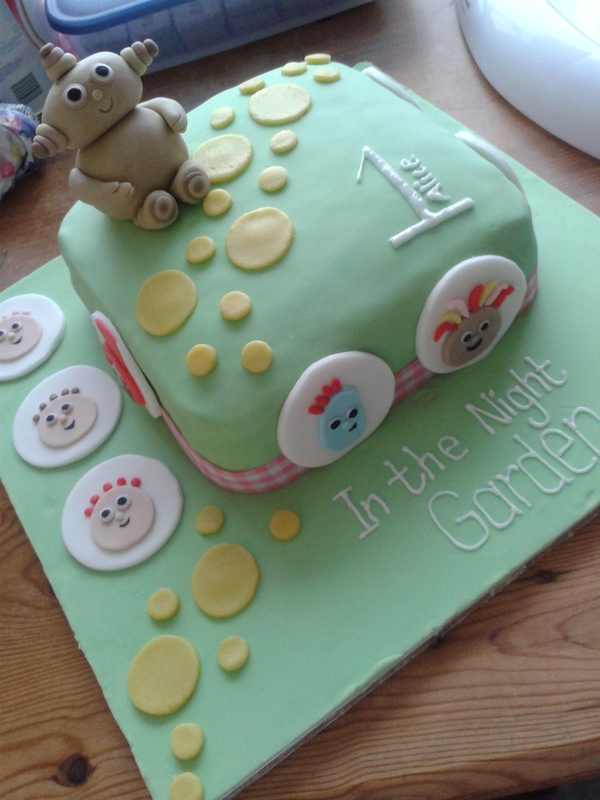 So this is it, my final In the Night Garden cake. There are lots of little bits that I would have changed on it but for my first time trying to do something like this I was happy with it and so were the family and friends who came along. The cake itself was a simple sponge filled with seedless raspberry jam and a buttercream. It is strange how when you put these ingredients together and use fondant icing then it always tastes shop bought? It was soft and moist and held together well when cut so I am pleased with how it tasted as well as looked. Next year I guess I am going to be doing this again, I wonder what she will like next time. *as in the Manga meaning of Chibi – cute, small, big eyes. It doesn’t seem long ago that I was sitting at home eating my cake that I’d made myself to pass the time and waiting for my little girl to be born; but fast forward almost a year and I’m suddenly planning her first birthday cake! On the 11th October Alice will be a whole year old. Wow. It’s been a very eventful time and although I haven’t baked as much as I though I might have whilst I was on maternity leave it’s something I wouldn’t have missed for the world. For her birthday I am planning on making 2 birthday cakes, the first will be a small cake which will be for her actual birthday. We are celebrating by taking her to a safari park along with her grandparents. I think this cake will be quite simple with plenty of number 1s all over it. The second birthday cake is taking a lot more planning as it’s for her party in which most of the family are invited! I’m having a little difficulty in planning this cake because I am not yet fully sure on the theme of it. The party is going to be a little mad hatter’s tea party but her favourite thing at the moment is the show In the Night Garden. So my brain is working overtime trying to pin it down! Now in my excited parent delirium I am considering making fondant figures for the cake. Oh dear, I might have ideas beyond my skill level but I’m sure I’ll come up with something. It might not be perfect but it’ll be home made, with love… and we can always stick a candle in. What ever happened to the Fairy Cake? Let me tell you a little story about a cake. There was once a little cake who everyone loved. 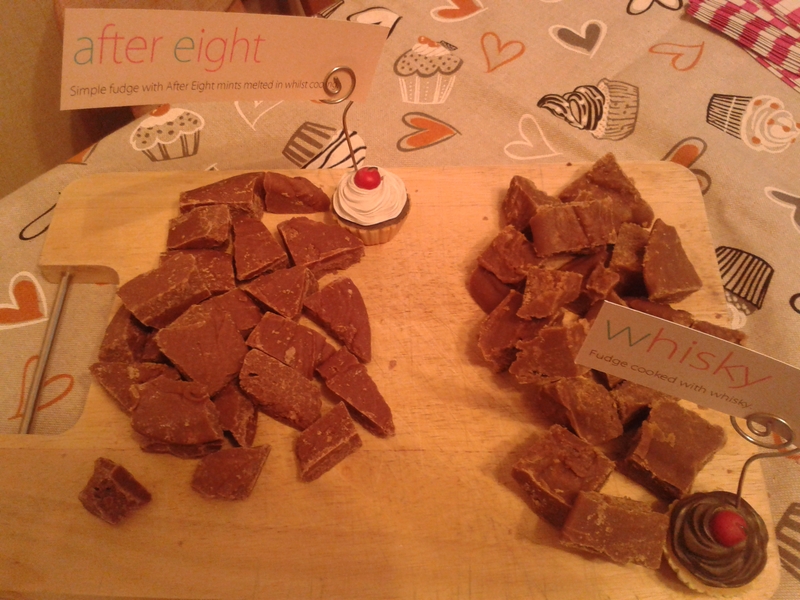 You would go to a party and there it would be sitting there happy and unassuming and everyone love the little cake. It was never too fancy for the grandparents to have or too boring for the children; and the cakes name was The Fairy Cake. Then one day a new cake came along and took over the Fairy Cakes place at the party table. It was always well decorated, sometimes even glittery and highly flavoured; and this cakes name was The Cupcake. Soon everyone forgot about the Fairy Cake, it was never invited to the party anymore and after a while people forgot they could make it. The End. But don’t be sad! 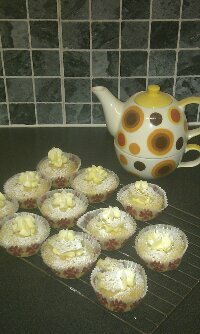 Tonight, whilst the little baker slept, I decided to do a bit of ‘old skool’ baking and made… the fairy cake! This was the first cake recipe I made when I started high school and I still have the recipe I wrote down about 17 years ago (has it really been that long?!) in my folder of magazine cutout recipes. I even drew a little picture of what it should look like, lest I forget. Now, don’t get me wrong I love cupcakes and they are fundamentally the same thing as a fairy cake, but I remember that every birthday party I went to as a kid used to have these. They always looked the same, very home made but ultimately very tasty. You have to make sure you don’t overbake them as a dry cake is never very nice and there isn’t the amount of buttercream icing that is used on a cupcake to hide behind. They are very much an as they come cake, nothing fancy but I love them. Let me know if you have made any cakes which seem to have been forgotten or send me pictures of your fairy cakes! Buttercream to decorate – margarine mixed with icing sugar and a little vanilla extract. No need to measure, just beat in enough icing sugar till it tastes good. In a bowl cream the sugar and margarine till light and fluffy. Add the eggs one at a time with some of the flour and beat in gently. Spoon the mix into fairy cake cases (these are the small cupcake ones). You should be able to get 12 out of this mix. Bake in the oven for 18-20 minutes. Test by gently pressing the top, it should spring back up. Allow to cool and decorate with a little blob of buttercream or icing sugar mixed with a little water. If you’re feeling really retro – add a glacé cherry.